Great Airbnb potential as is, or, privacy if you wish. Exquisite 2705 sq. ft., 4-bedroom, 4 bath home on 5.39 acres of quite seclusion. Built by a contractor as his personal home you will love the charm, thought and detail that has gone into not only the home but the whole property. Quality of construction can’t be beat. Beautifully decorated inside, inviting grounds outside. Perfectly maintained. Move in and start living your dream. Cement pathways lead to many potential sites for outdoor patios which can be placed under large Oak trees. Perfect for friends or Airbnb guest to gather. Three of the bedrooms have their own private bath. Huge master bedroom and bath with lots of closet space. Plenty of outdoor parking and two garages, one attached to home and one separate which could be used as a shop. This home has two new air conditioning units, new washer and dryer, intelligent refrigerator, gas stove, 40-year roof with lots of life left in it, very tasteful and low maintenance landscaping around the home. Well for water which last tested at 20 GPM and good water, has never gone dry even during the last severe drought. Septic has been pumped and certified. RV hook up, wired for hot tub and switch box for generator. Above the fog and below the snow describes our area. 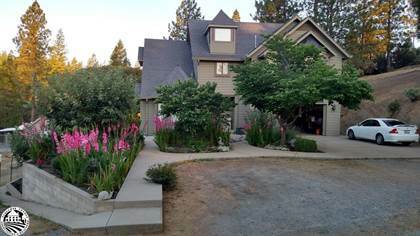 At the 3000-foot level of the Sierra Nevada foothills we enjoy a climate that is just about ideal. Winter temperatures are on a par with San Francisco and summer days are warm for the enjoyment of the outdoors and water sports, but at night the wind blows down from the mountains providing Mother Nature’s air conditioning. Sleep with the windows open at night in the quiet solitude of a sparsely populated area. No street lights to mar your view of the heavens, and yes, there really is a Milky Way. Activities and recreation abound with Yosemite National Park just to the east, Stanislaus National Forest very close by and Lake Don Pedro just to the west. Hiking, Biking, Fishing, water sports, river rafting plus, for you pilots, Pine Mountain Lake Airport is just a stone’s throw away. Hi, I'd like to find out more information about 20955 Whites Gulch Rd. Thanks so much!